"The spots were created by full-service Hispanic marketing communications agency, Wing. In an effort to bring Downy Ultra's long-lasting scent properties to life, Wing developed and created a funny :30 spot, "Lavadero" or "Laundry" starring two Latino men in a laundromat. What takes place shows that Latino men buy Downy too, and can appreciate a lasting scent experience! The spots began airing last week on Telemundo, LATV and KMPX (Dallas)." Hmm. This new Absolut commercial from TBWA\Chiat|Day called Anthem makes one yearn for the glorious days of the long-running and simply beautiful print campiagn that was the cornerstone of the brand for so long. Now we have all manner of over-production to convince us "doing things differently leads to something exceptional...in an Absolut world." Well, first of all, doing things differently is no guarantee of an exceptional results. And wasn't this Apple's deal? Remember Think Different? And how about in the real world. Don't we want exceptional things to happen in the real world and not cocooned about in some marketer-created dream world? Ok so we are way over analyzing things here. But we still yearn for the "absolute simplicity" of Absolut's yesteryear. In case you were wondering, the Miley Cyrus machine is alive and well. While we'd have to query a bunch of 12 year old girls to know for sure, it seems Miley is on her way to convincing kids it's (shudder) cool to buy clothes at Walmart. Out with her new line of clothing from Max Azria, Miley talks about what clothing means to her and what it was like to work with designer Max Azria. While far from sluterrific Britney Spears-inspired fashion, Miley says, "This line has inspired me to take chances with what I wear a little bit more." Ooo. Risky. But moms will be happy there's no belly shirts in this line of clothing. Yawn. Ozzy. Chimps. Yawn. Samsung. Yawn. Not because the animal lovers don't like them being used in commercials but, rather, because they are overused and the concepts are increasingly lame, we feel all primates should be banned from advertising. Yes, CareerBuilder, you heard us right. The chimpanzee thing is over. Dead. Done. And that's made crystal clear in this new Sansung Solstice commercial featuring Ozzy Osbourne and, yes, a band of chimpanzees. Or is it monkeys? We can never tell the difference. 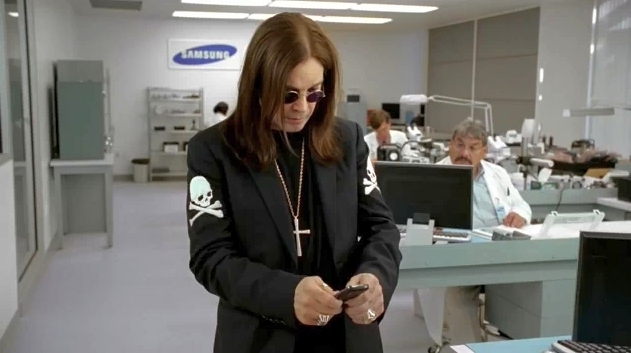 So Ozzy's getting atour of the Samsung facility and is shown the new phone. He drops a lame line about how cool Samsung is. He drops the F bomb (real surprise there) and he gets a text asking if he'd like to be in a new band...formed by the aforementioned chimps. And doesn't Samsung know the Solstice is a car? Oh wait. Not for much longer. Don't Flush That Toilet! Pee in the Shower Instead! This is what being eco-friendly has come to. Urging people to pee while taking a shower. Yes, it's true. There's really nothing else to say about this Brazilian effort to save water by not having to flush the toilet. Seriously? Seriously?? The product in this infomercial, Shake Weight, should have been named How to More Vigorously Pleasure Your Man. Watch this infomercial and you'll know exactly why we feel that way. OK, see? Are we right or what? So yea, don't you always wake up all hot-looking like this with your clothes magically dressing you all by themselves? Apparently, it's business as usual for the woman in this Mudd Jean commercial. And when you walk to work, you strut like a model coming down the catwalk, too, right? Every office contact is a flirtatious event and you absolutely own the nightclub when you go out at night. Right?